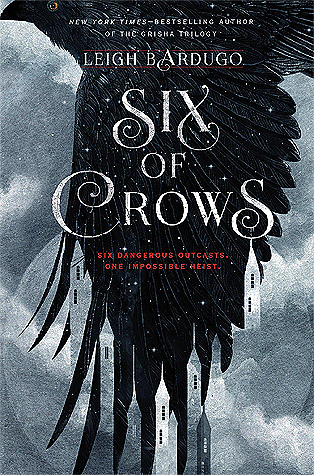 Review in a Nutshell: Six of Crows is a beautifully written, captivating heist novel with characters that will stick with you long after you close the pages. Six of Crows follows outcasts in the criminal underground of Ketterdam. When offered more money then they could ever imagine, they embark on a mission to break into the impenetrable Ice Court. This book takes place in the same world as Bardugo’s Grisha Trilogy, but it’s not necessary for you to read that before jumping into this series (but I do recommend it. It adds, admittedly not needed, layers to the worldbuilding and some side characters that you may miss out on otherwise). Where the Grisha Trilogy takes place is Ravka, Six of Crows takes place in Kerch (and Fjerda). The world is remarkably well developed– you can tell Leigh Bardugo spent a lot of time creating this fascinating world. Leigh Bardugo is a goddess. That’s the only way she can write so well. Her prose is elegant and beautiful, with dialogue to match. Every line is amazing, invoking emotion and grabbing your interest. Here is my only possible complaint about Six of Crows: The beginning can be a little hard to get into. It’s slower than your typical YA at first (it does pick up in pace halfway through). That said, even the slowest parts are amazing. This plot is complicated and there’s a lot of violence, action, and angst, but there’s also romance, humor, and friendship to give you a break after reading about someone’s eye being plucked out. Speaking of romance– the romances in this book are absolutely perfect, never taking the spotlight away from the characters and the main plot. The characters in this book are probably my favorite book characters of all time (which makes sense, considering this is my favorite book). Leigh Bardugo creates compelling, diverse, characters, and I can promise that you will fall in love with this group. Kaz Brekker – Kaz was written for everyone who loved the Darkling and wanted to see him redeemed. He is a fascinating protagonist who could just as easily be a villain in another story. One of my favorite parts of this book was unwrapping his past and the trauma’s he’s endured, and seeing what led to him becoming Dirtyhands. Inej Ghafa – Inej is just amazing. She is the moral compass in a group of thieves, liars, and gamblers. Her relationship with Kaz is just perfect, and I loved her dedication and commitment to her beliefs. Jesper Fahey – I love this bi disaster. Jesper is a hilarious, entertaining character with heart. He lights up any scene he’s in, making you smile even when something horrible just happened. Wylan Van Eck – This boy is too precious. At first, he wasn’t my favorite member of the Dregs (but to be honest, he had a lot of competition), but I really began to love him over the course of the book. Nina Zenik – Nina is everything. She is such a fantastic character. Confident, strong, and loyal. She adds a lot of humor to this book, but also so much heart. Matthias Helvar – Matthias’ character arc in this story is absolutely amazing. He’s definitely the character with the most growth and change in this series, and I loved watching it. Cons- The beginning may feel a little slow. Also– this book will ruin you for all other books. Six of Crows is perfection. It is joy and sadness and fear and excitement, all melted together in a story that will never let you go. Lovedddd this book! Totally get wanting to fan girl over it! My entire life is just me fangirling over this series. I can’t wait for King of Scars in January so I can fangirl even more!